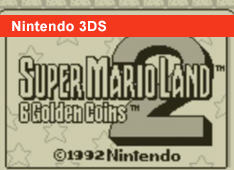 Contest: Super Mario Land 2: 6 Golden Coins Giveaway! Update Winner Announced! We're happy to announce that we're holding yet another contest here on our website! One random active member will be randomly drawn and will receive a North American download code for the 3DS VC title Super Mario Land 2: 6 Golden Coins! The contest ends at 6:00 PM PST on February 13th and the lucky winner will be announced later that evening! To enter you must be a registered member of WiiWareWave "you can enter as long as you register before the end of the contest". You must also post at least 10 messages during the contest period which lasts from now until 6:00PM PST on February 13th. You must be 13 years of age or older to participate. If your account is chosen we will send you a PM with the download code inside as well as a congratulatory message! Good luck and have fun! @Tech101 has been drawn as our lucky winner of this contest! He accumulated a total of 10 posts since the contest statrted just in the nick of time! Your download code has already been sent via. PM be sure to check your inbox! Congratulations to the winner! Everyone else who posted at least 10 messages will receive a consolation prize of 250 WiiWareWave Coins for our forum shop! Re: Contest: Super Mario Land 2: 6 Golden Coins Giveaway! Update Winner Announced! These contests are awesome! Thanks @WiiWareWave! What an excellent way to promote posting on this site! GamerZack87 wrote: What an excellent way to promote posting on this site! We'll be holding a contest for our Aussie members sometime next month so stay tuned. I doubt that I'll be drawn, but I would like to win this game as I haven't downloaded it yet. Well done, @Tech101. SML2 is a brilliant game, so you're in for a treat! Wow, 250 Coins? I still have yet to spend any of the other 33000+ Coins which I've accumulated over the years. I've turned into a Wario-like character with my massive coin stash!